Easy weeknight twist on pork chops and applesauce. Brown chops in oil in large nonstick skillet on medium-high heat 3 min. on each side. Remove from skillet; set aside. Add 2 Tbsp. of the dressing, onions, garlic and rosemary to skillet. Cook 3 min. Return chops to skillet. Add pears and remaining 2 Tbsp. dressing. Simmer on medium heat 10 min. or until chops are cooked through (160ºF). Arrange chops on platter; spoon sauce over chops. 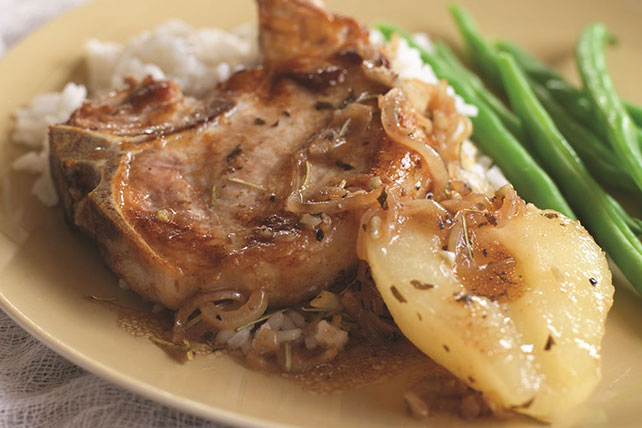 Help your family eat right, try these pork chops simmered with pears and Calorie-Wise dressing. They'll be ready in just 30 minutes!